This course strictly covers all the Cisco CCNA Security Exam objectives. 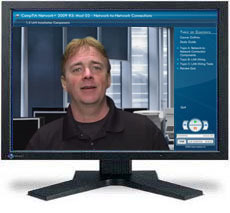 Ken is a Microsoft Certified Trainer as well as a Cisco Trainer, Linux Trainer and Security Consultant. He started his career in computer technology in the 1980's and has gone on to offer a wide variety of IT training and high level consulting projects for Fortune 500 companies across the United States and Western Europe. Ken has been involved in nearly all aspects of the Enterprise Network Architecture, from the Network Operating systems of Microsoft, Novell, and Linux platforms to the infrastructure design, implementation, and management using Cisco and Juniper products. His many certifications include MS Networking Trainer & Consultant - Windows 2003/2008, Microsoft Certified Instructor (MCT), Cisco Certified Instructor (CCSI), CCNA, CCDA, CCNP, CISSP, Juniper Certified Instructor, Juniper JNCIA, JNCIS, JNCIP (M-Series), Juniper JNCIS (Enterprise Routing), Juniper JNCIA/S (FWV/SSL/IDP), Certified Ethical Hacker (EC Council) certified trainer and consultant, Certified Computer Examiner (Digital Forensics), Certified Pen Testing Specialist and Instructor. Why Do You Need a Security Policy? Who Uses the Security Policy? The SQL Slammer Worm 30 minutes After "Release"
Example: Creating a View Named "NetOps"
Why Use Cisco Secure ACS? Why Worry About Layer 2 Security?